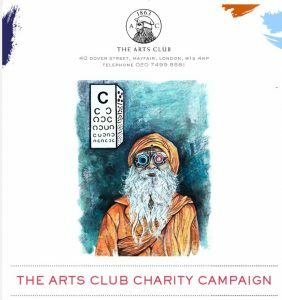 In October, Savitri had the pleasure of being partnered with The Arts Club to raise money for life changing cataract surgeries. For one month, diners at The Arts Club’s Brasserie, Member’s Lounge and in-house nightclub, “1863”, were given the option to donate £3 towards the cause. A beautifully illustrated postcard by artist Pip Johnston accompanied each bill giving diners an insight into the eye care programmes their donation would support. We are pleased to say that together we raised over £8,000! We would like to thank The Arts Club for this opportunity, their diners for their kind generosity and Pip for her artistic handiwork.